It’s Hatch chili season and hubs and I went to a cooking class at a local supermarket. I used to volunteer at the cooking school so I know several of the chefs. This class was amazing and totally inspired me to use hatch chilies in everything. So I came up with Hatch Chili Chicken Mac n Cheese! *Hatch chilies are actually anaheim chilies that are grown in Hatch, NM. Just a factoid I learned in class and thought I would share. Grill chicken (seasoned with salt and pepper) and set aside. Boil pasta according to package. Saute onion in butter until translucent add garlic and chilies. Bring chicken stock to a low boil. Add flour and cook 1-2 minutes. Toss in cheese and melt. Add small amount of stock and half and half to loosen the cheese. Add salt and pepper to taste. Dice chicken, and toss with pasta and cheese. Place in a baking dish and cover with bread crumbs. Bake for 15-20 minutes until bubbly. 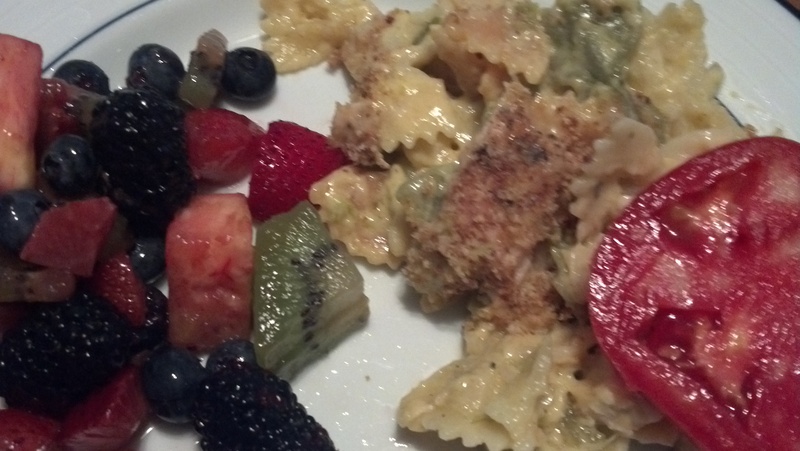 Pair your Hatch Mac n Cheese with a fruit salad and enjoy. What would you put hatch chilies in? Posted in Main Dish, Recipes and tagged chicken mac n cheese, hatch chili mac n cheese, hatch chilies. Bookmark the permalink.